An unheralded metal could become a crucial part of the renewables revolution. Vanadium is used in new batteries which can store large amounts of energy almost indefinitely, perfect for remote wind or solar farms. And what’s more there is loads of the stuff simply lying around in industrial dumps. Don’t let the dumpster diving put you off – never mind gold or silver, vanadium may just be the most beautiful metal of all. It’s the 22nd most abundant element in the Earth’s crust, though it’s rarely found naturally in its metallic form. Instead, vanadium can be found in more than 100 different minerals. 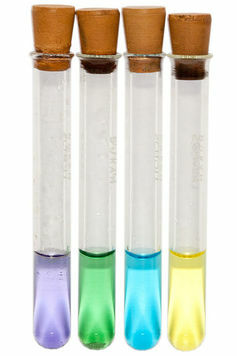 Once extracted and dissolved in water, various forms of vanadium turn into bright, bold colours. It’s even named after “Vanadis”, the old Norse name for the Scandinavian goddess of beauty, Freyja. Vanadium is not only beautiful, but also strong. Adding small percentages of it creates exceptionally light, tough and more resilient steel alloys. Henry Ford was the first to use it on an industrial scale, in the 1908 Model T car chassis, and today the vast majority of vanadium is used in structural steel, mainly to build bridges and buildings. The unique properties of vanadium make it ideal for a new type of batteries that may revolutionise energy systems in the near future – redox flow batteries. Batteries store energy and generate electricity by a reaction between two different materials – typically solid zinc and manganese. In flow batteries, these materials are liquid and have different electric charges. Both are pumped into a “cell” where the electric current is generated. A tiny membrane separates the two liquids, so they are able to react but don’t come into direct contact. Vanadium is used in these batteries as it can convert back and forth from its various different states, which can carry different positive charges. As only one material is used, the risk of cross contamination is eliminated. The liquids have an indefinite life, so the replacement costs are low and there are no waste disposal problems. Also, the battery is extended to a potentially infinite lifetime. Vanadium flow batteries are too big and heavy to replace the lithium batteries found in your phone, however. These batteries are instead used for large stationary long-term energy storage, or to supply remote areas, or provide backup power. They’re the basis for a more efficient, reliable, and cleaner electrical energy market. Energy storage is one of the main factors limiting the spread of renewables. When solar and wind power is produced at the wrong time of day we need to store it to use it during the evening demand peaks. Studies have shown that vanadium batteries can be a sustainable solution. When we can create huge stores of energy to access as required, we will be liberated from the need to maintain rapidly-accessible energy generation such as coal or gas. Vanadium batteries can be a reservoir of energy much in the same way as we use actual reservoirs to store rainwater for later use. The ability to store electricity would reduce reliance on gas and coal. In turn this would increase fuel security and cut CO2 emissions, helping to meet agreed emissions targets. No wonder then that the EU considers vanadium a critical metal for strategic energy technologies. The metal is mined, and supplies are currently dominated by China, South Africa, Russia and the US. Vanadium has a medium risk of supply shortage and a high political risk. However, as vanadium can be a byproduct of other sorts of mining, about 70% of the vanadium above ground is unused, left in industrial wastes such as mine tailings, debris or steel slags. In fact, a study I published with colleagues last year estimated that 43% of the annual global production of vanadium could be recovered from alkaline wastes, such as steel slag, red mud, fly ashes from coal energy production, and construction and demolition waste. But there isn’t yet a firmly established technology to recover this vanadium. Certain bacteria and fungi can extract more vanadium from industrial wastes, and various solutions for turning this into useful metal are under development. But we still need to come up with a better way to reach potential sources of this beautiful metal.